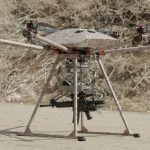 Future Drones will Change the Map of Wars Florida: Engineers in the US have developed drones that are equipped with automatic machine guns and can quickly eliminate enemies by sending them into terrorism-affected areas. Future Drones will Change the Map of Wars. Duke Robotics, a US-based firm in Florida, recently announced a multi-router drone, named TIAD.